BRISTOL, CT—With the 36th and final pick of the 2011 WNBA Draft, the Seattle Storm selected 6-foot-5 center and rebound specialist Krystal Thomas, thereby officially making her the saddest woman in the United States of America. Thomas, a psychology major who had been planning to go to medical school before suffering the tragedy of being chosen for a woman's professional basketball team, was too distraught to actually watch the draft Monday night. She learned her fate from friends and family and immediately succumbed to depression severe enough to make her, by all accepted standards of measurement, the nation's saddest woman. Thomas was reportedly so inconsolable that she easily eclipsed America's previous saddest woman, 42-year-old Delaware resident Mary Vernon, who lost her family and both her hands in a tragic car accident last month. 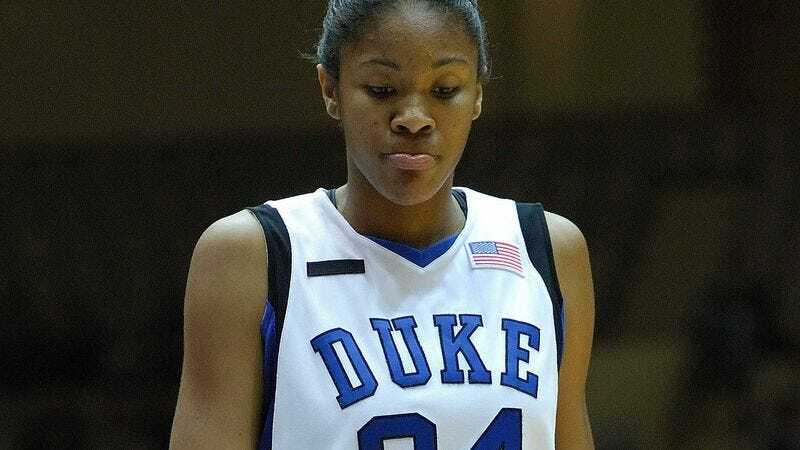 "I was already pretty down about just being a prospective draft pick," said Thomas, who is sixth on the Duke all-time rebounds list, was only the second Blue Devil to tally 300 rebounds in a season, and had hoped to end her basketball career with pride and dignity. "This is absolutely devastating. I'm crushed." "Just last week, my life seemed worth living," added Thomas, her voice quavering. "But now… Now I'm in the WNBA. And I was chosen last." Thomas, who has not showered or changed out of her bathrobe since learning about her selection, claimed her pain was made even worse by knowing she would arguably be the worst player on the current WNBA championship squad and in all likelihood would see very little playing time. "How am I supposed to get out of bed in the morning knowing that?" Thomas told reporters. "Assuming I do find the strength to live through this, how am I supposed to tell my kids someday that their mother was the last lady picked to play in the women's NBA? Well, maybe this is God's way of telling me I don't deserve to have kids. Or a family. Or friends. Or to play basketball, obviously." "To be honest, I don't quite know if playing would actually make me happy," Thomas added. "I talked to [Storm star player and 43rd saddest woman in America] Lauren Jackson, who said that each time she's been named league MVP she's died a little inside. We basically cried a lot during the conversation and tried to console each other." Those close to Thomas said they were worried about her health and well-being, and would be keeping a close eye on her in the days leading up to training camp. "Things like this aren't supposed to happen to people like Krystal," said Karima Christmas, Thomas' close friend and Duke teammate. "She's smart, she's kind, she's worked hard all her life, and this is her reward? To be a backup center in Seattle? She deserves better." To help Thomas weather the overwhelming sense of worthlessness and desolation that comes with being chosen last in the WNBA Draft, the league has sent grief counselors to work with her, saying that the next few days will be crucial if she is to ever regain anything like a normal emotional equilibrium. "There's no reason this has to derail her life," said Dr. Emily Falbaum, a licensed sports therapist who has helped many previous last WNBA Draft picks to recover from grief and reach a state of acceptance. "The first thing she must do is stop obsessing on what might have been—med school, making new friends, career fulfillment, the respect of others. She can't go on until she accepts the tragic fact that for the next few years of her life, she will be making $18,000 a year playing very few minutes in some of America's most mediocre cities for a few dozen halfhearted fans." Since being named saddest woman in America, Thomas has received sympathy messages by the hundreds, many of which have come from those almost as bereaved as Thomas herself, such as the recently divorced and laid off, children in burn wards, and players and coaches in the WNBA. "Krystal, we are deeply saddened for you and your family," a condolence card from the Seattle Storm team read in part. "But you can take comfort knowing that you are not alone. Last year we won the WNBA championship trophy, so we have some sense of the empty sensation you must be feeling right now, a feeling as if the entire universe has made a mockery of you. If you want to talk about it, just know we are here for you. And that we're very, very sorry."